Where cannabis is concerned, this moment in American political culture appears to exemplify Hegel's paradoxical unity of opposites. President Trump's former Attorney General, Jeff Sessions, rolled back Obama-era leniency with respect to federal marijuana law enforcement. Trump, meanwhile, has declared a national emergency, citing the flow of illegal drugs as well as migrants over the Mexican border as a pretext for building a wall. Yet in the same 2016 election that brought Trump to office, California, Massachusetts, Maine and Nevada all voted to legalize cannabis. Last year they were joined by Vermont — the only state to legalize by an act of the legislature rather than popular referendum — and, in the November election, Michigan. This brings to 10 the number of states with legal cannabis, and the portion of the populace living in such states to well over 20%. 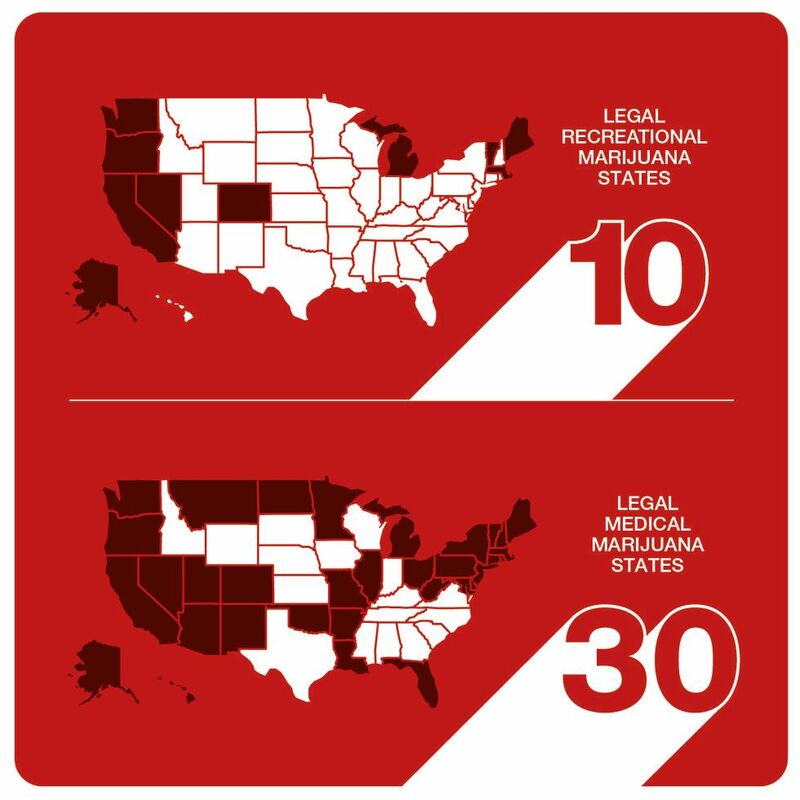 A further 30 states have legalized medical marijuana in one form or another (not necessarily including use of herbaceous cannabis, but extracts and tinctures), and several more have provisions for medicinal use of the non-psychoactive cannabinoid CBD. 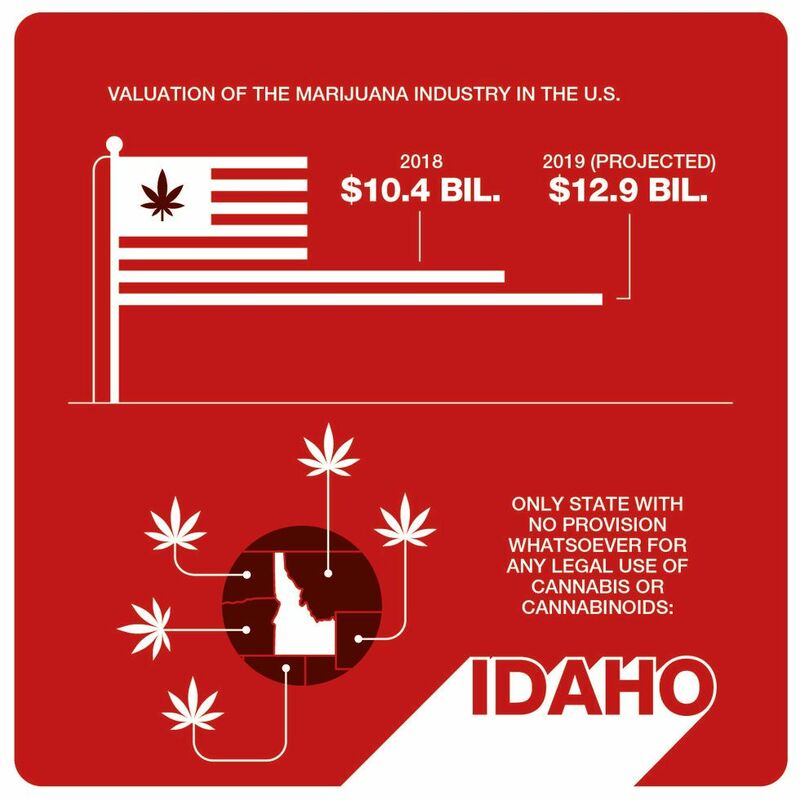 Idaho alone has no provision whatsoever for any legal use of cannabis or cannabinoids. Yet 40,000 people remain incarcerated in state and federal prison on cannabis-related convictions — about half of them for marijuana offenses alone. When those waiting to see a judge in local jails are added in, the figure may approach 100,000 at any given time — with the usual racial disparity, of course. According to the American Civil Liberties Union, based on national data, blacks are more than three times as likely as whites to be arrested for pot — despite using the stuff at essentially similar rates. When then-Attorney General Sessions last year called on federal prosecutors to seek the death penalty in drug cases, there was an eruption of paranoia that state-legal captains of industry in California and Colorado could be targeted under a harsh drug law signed by Bill Clinton in 1994 — which indeed makes "trafficking" in 60,000 kilos or more of cannabis a capital offense. This is an absurd contradiction, and there is one obvious way to resolve it: The United States could follow in the footsteps of its northern neighbor Canada by legalizing cannabis coast to coast, by federal law. Perhaps, even under Trump, it is no longer as unthinkable as it once was. But what would it actually look like, and how can we get there? Erik Altieri is the executive director of the National Organization for the Reform of Marijuana Laws (NORML), which has been working toward this aim since its founding in 1970. Asked about the prospects for nationwide legalization, he waxes optimistic. "With 10 states and the District of Columbia now having legalized marijuana for adult use and over 60% of all Americans supporting an end to our failed prohibition, it is now a question of when, not if, legalization will become the status quo nationwide," Altieri asserts. And what legalization could look like is no longer a matter of mere speculation. "Thankfully, these conversations no longer exist in a vacuum, as we have data from numerous states, starting with Washington and Colorado, which legalized marijuana in 2012, about the impact this policy has on communities," he says. Altieri predicts a positive impact on national incarceration rates. "What we've seen is that, quite obviously, states that legalize marijuana arrest far less people than states that retain criminalization," he states. 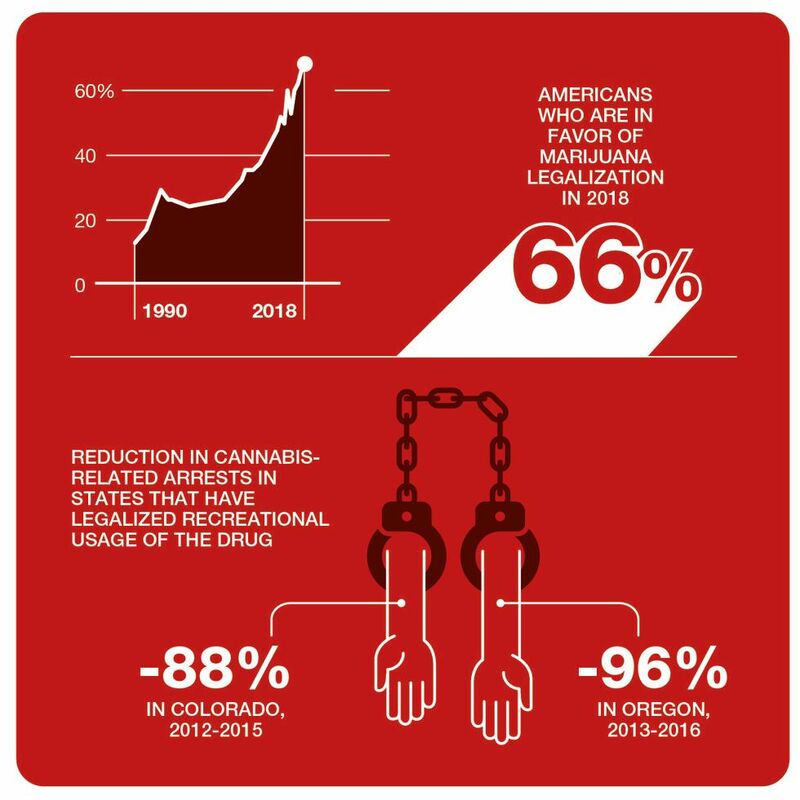 And indeed, a study released last year by the Drug Policy Alliance, "From Prohibition to Progress: A Status Report on Marijuana Legalization," found that total cannabis arrests have declined sharply in states that have legalized. Colorado experienced an 88% drop between 2012 and 2015. Oregon saw a 96% drop from 2013 to 2016. Altieri continues: "Over 650,000 Americans are still arrested annually across the country for marijuana-related crimes; these arrests consume law enforcement and judicial resources that can be better utilized to combat violent crime. States that move to legalization and regulation effectively end the practice of arresting otherwise law-abiding cannabis consumers and immediately reap the social and financial benefits from simply ending arrests." The question of those already behind bars in states that have legalized is a sticky one. California's then-Governor Jerry Brown signed a bill last year that will allow past cannabis convictions to be dismissed or sealed if the quantities in question would no longer violate the law under the Adult Use of Marijuana Act, passed by California voters in Proposition 64 in 2016. Washington state is also taking steps to wipe out old cannabis convictions. The legalization referendum that failed in North Dakota in November explicitly included a measure for expungement of past cannabis convictions. Additionally, many have drawn an analogy to alcohol Prohibition, which fueled gangland violence in the 1920s. The violence abated after repeal in 1933, and cannabis advocates say decoupling marijuana from criminal gangs through legalization could similarly lead to safer cities. There are studies to back up this idea. One published in The Economic Journal last year noted a reduction in violence in US states along the Mexican border in recent years, especially in the counties along the frontier. The study saw a link to the reduced legal pressure on cannabis in the US over this same period, thanks to legalization and medical marijuana laws. All of the southern border states now have medical marijuana laws, and California, of course, has actually legalized. Along with changes to the criminal justice system, Altieri emphasizes the economic benefits that would come with widespread cannabis legalization. "Cannabis sales generate much-needed tax revenue for social programs such as education and substance abuse prevention," he enthuses. "Legalization provides enormous upside to states, allowing them to better allocate their law enforcement resources, generating new tax revenue, decreasing incarceration rates of nonviolent offenders and promoting civil liberties — with very little downside to be found in the real-world data." The entire legal marijuana industry in the U.S. was valued at $10.4 billion last year, and states have been raking in tax money. Colorado has seen a steady increase in state marijuana taxes year over year, reaping over $266 million in taxes in 2018. 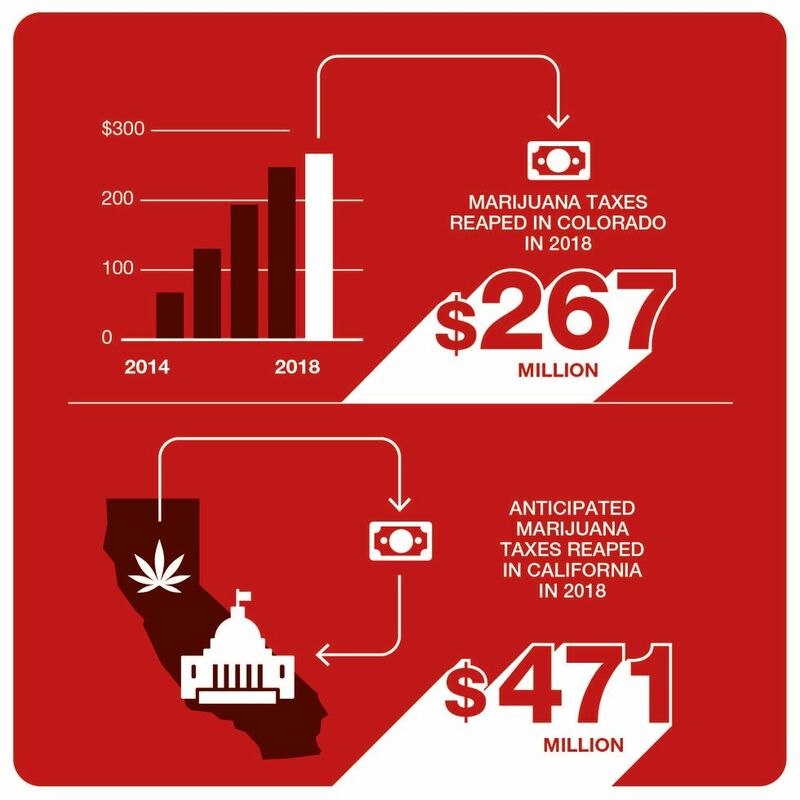 California, meanwhile, is anticipated to have collected around $471 million in taxes in the same time period, although this number falls significantly short of the original projection of $630 million — a deficit that's been attributed to a mix of complicated regulations and the fact that many cities in the state do not allow cannabis businesses to operate in their locales, among other factors. But whatever economic excitement may exist on the state level is tempered by the formidable hurdles Altieri sees at the federal level. "In order for legalization to have any notable impact on the federal budget and deficit, it would require that our federal officials de-schedule marijuana from the Controlled Substances Act and create federal excise taxes on marijuana production and sales," he says. In legalizing medical marijuana last year, the UK's Home Office took the step of removing cannabis from Schedule I — an international designation for drugs, such as heroin, with no medical application and high potential for abuse. It was placed in Schedule II, reserved for drugs, such as morphine and cocaine, with legitimate medical uses. Like most other countries, the US keeps it in Schedule I — a clear anachronism, as even the FDA has approved use of CBD-infused products for treatment of epilepsy. Advocates call for removing cannabis entirely from the schedule system established by the UN Single Convention treaty (and codified in the US by the 1970 Controlled Substances Act) and making it "over the counter." A federal excise tax on cannabis could generate an additional $500 million annually for the federal government. Altieri cites a recent analysis by the Tax Foundation finding that a federal excise tax on cannabis could generate an additional $500 million annually for the federal government. That falls short of the approximately $10 billion the feds collect from excise taxes on alcohol, or the $14 billion from tobacco — but it's still significant. "When you factor in payroll and corporate taxes that would be associated with the cannabis industry, that number can skyrocket to several billion dollars a year or more," he says. "While these amounts won't end or reverse the federal deficit or magically solve all the country's problems, that is several billion dollars annually that the government did not have before when most of that money was being diverted into the illicit black market. Tax revenues from marijuana, if legalized federally, would provide a modest, but respectable, new income stream to fund important services, and is one with potential for serious growth over time." It should be noted that the high hopes voiced when nationwide legalization took effect in Canada in October have been somewhat humbled by a bumpy start. Small producers and unlicensed retail outlets have found themselves operating in a legal "gray zone." Purveyors of "craft cannabis" have a niche in Canada's legalized market, but they must sell to one of the big licensed producers grandfathered in from the medical marijuana program. Unlicensed retail outlets that prospered for years in the gray zone, meanwhile, are ironically being shut down in Vancouver under legalization. And indeed, since Canadian legalization took effect, the big licensed producers and approved retailers have complained of disappointing sales even while struggling to meet a booming demand — a strange paradox that points to a shaky system. With each province free to set its own policies regulating sales, a confusing patchwork reigns nationally. And in provinces where the government maintains a monopoly on sales, orders from the licensed producers have been overly cautious, creating a bottleneck. A real concern about cannabis legalization is its possible impact on highway safety. Critics cite a rise in "marijuana-related" accidents in California and Colorado since legalization — but this is an inherently problematic phrase. Testing positive for cannabis doesn't mean a motorist was under the influence at the time of the accident. That's because the psychoactive cannabinoid THC stays in your body much longer than alcohol — weeks after the effects wear off. Also, an accident can still be listed as "marijuana-related" even if other, more incapacitating drugs were involved. Finally, an increase in road fatalities in states that have legalized is consistent with the national trend — probably related to more people being on the roads due to low oil prices. A 2011 study by the University of Colorado at Denver — from before the oil slump — actually found a reduction in traffic fatalities in states that had legalized medical marijuana. A conjectured explanation is that folks had been turning to legal cannabis instead of alcohol, which impairs driving far more dramatically. No organization takes this issue more seriously than Mothers Against Drunk Driving. MADD's chief government affairs officer JT Griffin, reached for comment, had this to say: "We're not prohibitionist when it comes to alcohol, so we're not when it comes to marijuana either. That's something states have to decide for themselves. We do call upon states to examine any traffic safety or impaired driving implications in order to make sure that the roads are safe." How to do that will be contingent on science that just isn't in yet, Griffin acknowledges. "We've studied alcohol since the end of Prohibition in the 1930s, so we know a lot about how it affects motor abilities and the brain," he says. "But there's so much that we don't know about marijuana when it comes to impairment. As we try to learn those things and determine what impairment looks like, it's important that police have the tools to get impaired drivers off the road." "When it comes to alcohol, we have .08," he elaborates. "Everyone knows when you have .08 blood content, you're too impaired to drive. As drugs are legalized, lawmakers and opinion leaders want a .08." But it's not so simple. Griffin cites an October 2018 study by the Insurance Institute for Highway Safety. "It found that you're not going to get a .08 because marijuana affects the body differently than alcohol does," he says. "So law enforcement needs to understand what someone who is impaired by marijuana looks like when they're driving, and how to give that person a test to determine if they're actually impaired." And he emphasizes: "Alcohol is the still the biggest thing out there — the most commonly used drug in the country, and the commonly used drug that's impairing people behind the wheel…Alcohol, speeding and not wearing a seatbelt are the three biggest factors — and a lot of the time they go together. As a country, we should not forget that alcohol is the biggest killer." Finally, a 2015 study by the National Highway Traffic Safety Administration confirmed that drivers high on cannabis are not nearly as impaired as drunk drivers. As The Washington Post summed up those findings: "After adjusting for age, gender, race and alcohol use, drivers who tested positive for marijuana were no more likely to crash than those who had not used any drugs or alcohol prior to driving." Any advance for cannabis will inevitably open new contradictions. This is especially clear in the rise of "corporate cannabis" (or "Big Bud") in California. Central Valley agribusiness interests have ditched rice and cauliflower for the lucrative newly legal commodity, pushing the traditional small growers of the northern "Emerald Triangle" off the market. Police raids in the Emerald Triangle have continued since legalization, as many growers choose to remain on the black market due to perceived burdensome regulation and taxation of the legal sector. And the persistence of the black market has also meant that legal sales have not lived up to the high expectations. When the Prop 64 legalization initiative passed in 2016, state officials foresaw some 6,000 cannabis shops licensed in the first few years. Instead, just some 540 new licenses have been issued, on top of some 1,800 grandfathered in from the medical marijuana program. Both Denver and the San Francisco Bay Area have seen the phenomenon of "cannabis gentrification," with money from the new industry pouring in, driving up rents and displacing low-income communities. Also, it should be noted that even as overall cannabis arrests have dropped under more tolerant laws and enforcement policies in many states and localities, the racial disparity in those arrests that continue (e.g. for public use) is unabated. In 2016, Oakland became one of the first cities to address these issues with a "cannabis equity" ordinance, mandating that those communities — largely black and Latino — that suffered the highest rates of marijuana busts should now be prioritized for cannabis business. Other municipalities followed, and last September the state house in Sacramento passed a cannabis equity law instating such policies across California. One bitter irony is that the struggle for medical marijuana in the AIDS crisis of the '90s is what first opened legal space for cannabis use in California. The 1996 passage of the Prop 215 medical marijuana initiative was the first step toward the current wave of state legalization policies. But under the current regulations for legal cannabis in California, medical marijuana is taxed at the same high rate as "recreational" cannabis. Under legalization, legal space has paradoxically closed for "compassionate care" providers — those who make free or discounted medical marijuana available to the ailing. And Sacramento has not yet addressed this problem. That, however, is not an argument against it. Some progress on the federal level was actually seen at the end of 2018, with passage of the Farm Bill that legalizes cultivation of hemp — defined as those strains of cannabis with 0.3% THC or under, well below the psychoactive threshold. The bill was pushed by Republican Senate majority leader Mitch McConnell, under pressure from farmers in his own state of Kentucky who want to grow hemp. Significantly, the bill actually legalizes (de-schedules) CBD — but only that derived from the low-THC hemp strains. This is another absurdity, as the molecular make-up of a cannabinoid is identical regardless of whether it is derived from "hemp" or "marijuana." So there is some optimism in the ranks. Chris Conrad, a longtime California cannabis advocate, actually thinks it can happen. He forecasts: "House Democrats are already poised to pass cannabis de-scheduling legislation over to the Senate, where it either passes or gets attached to another bill and passes, then the president signs it and claims a victory in summer or winter of 2019. Unfortunately, Senator McConnell has authoritarian tendencies and could block legislation from getting a floor vote. But on the other hand, his role in de-scheduling industrial hemp suggests that he might be open to it." Conrad sees a second scenario as more likely: "McConnell will bottle House bills up in 2019 but let legalization pass the Senate in early 2020 as a way to grab the youth vote going into the fall elections or, at least, to take the issue away from Democrats to campaign on." What Conrad sees as a third and perhaps most likely path is for the president to do it by executive order in the later part of 2020 "for that same political motive." He adds, wryly: "The best tactic is always to play up to his vanity. For example, someone could name a strain of cannabis 'Trump Gold' and announce that it won a tremendous contest for the best, most terrific strain of cannabis in the world, maybe the best of all time. But nobody can get it because it's illegal…unless The Donald orders the DEA to take marijuana out of the CSA. Plus, someone might point out that he personally could get a huge commission by licensing his name to it, being the most popular strain ever in the world and all." "On one hand, federal legalization will bring the possibility of interstate sales, and that will greatly increase the size of the market for small producers," she says. 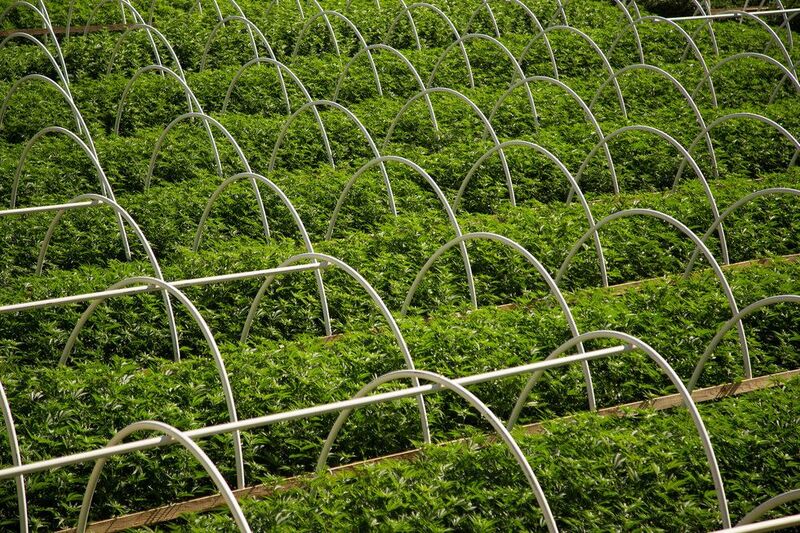 "On the other hand, small craft cannabis farms are feeling the strong need to band together to be able to cut costs while also continuing to improve the quality of their product in order to stand out. Like fine wine and fine cheese, artisanal cannabis must command higher prices." There may be a sense here of counting chickens before they hatch. But it would certainly vindicate a dialectical understanding of history if this moment of deep political reaction gave birth to the long-sought breakthrough for an herb already used on a regular basis by some 40 million Americans — more than 10% of the country's total population. Bill Weinberg writes for Cannabis Now magazine, and blogs at his own website, CounterVortex.org.